If you are actively using Google+ (Google’s Social Network) and also looking for a way to continue using it actively when you are on the move and don’t have internet connection then for you Google has a feature by which now you can update your status on Google+ via SMS. According to their blog post this feature was available in India and US from June last year, however I never found it (or it was their but my eye didn’t noticed it). And now they made Google+ SMS available in more than 40 countries. Afghanistan, Algeria, Angola, Bahrain, Benin, Cambodia, Cameroon, Congo (DRC), Cote D’Ivoire, Egypt, Ghana, Guinea, India, Indonesia, Iraq, Israel, Jordan, Kazakhstan, Kenya, Kuwait, Kyrgyzstan, Liberia, Malawi, Malaysia, Maldives, Morocco, Mozambique, Niger, Nigeria, Pakistan, Philippines, Saudi Arabia, Senegal, Sierra Leone, Sri Lanka, Tanzania, Thailand, Tunisia, Uganda, US, Uzbekistan, Vietnam and Zambia. 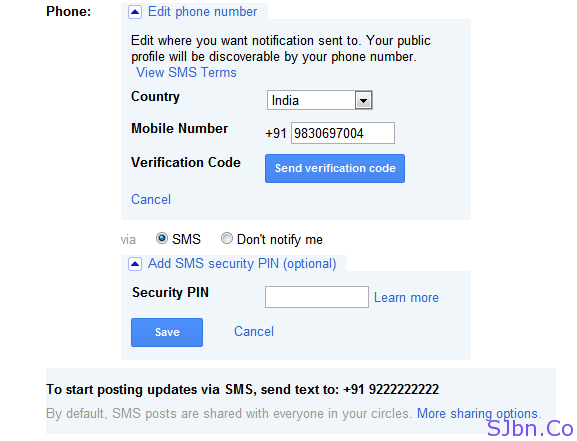 Now to update your Google+ status by sending an SMS to +91-92-2222-2222 (only for people in India) with your status and it will get posted on your Google+ news feed. For people from other countries can see their numbers and supported service providers here. And if someone comments on their post or updates you will receive an SMS containing that comment, depending upon if you have enabled Receive notifications option in Google+ settings page. 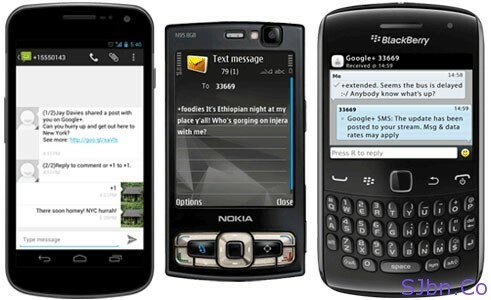 While actual SMS attacks are quite rare, it is technically possible for an attacker to spoof an SMS. For example, by sending an SMS to Google that appears as though it came from you, while in fact it did not. So to solve this problem you can also set SMS security PIN, which you can choose by yourself so that it is easy to remember and you need to add that PIN in starting of message every time you send an update.